It’s been nearly ten years since I’ve traveled on vacation with my family. In May, as a group of 11, we embarked on a week-long trip to Hawaii. We adventured around the island of Oahu and we couldn’t have asked for a better time! It was my first time in Hawaii, and it’s no lie when they say that it is paradise! Seeing that getting the entire family out to Hawaii is likely a once in a lifetime kind of experience, I surprised my sister and mom with matching swimwear and outfits from Joe Fresh’s recent collection in collaboration with lemlem, an artisan-driven collection of women’s, men’s, children’s and home goods made entirely in Africa. This capsule collection supports the lemlem Foundation which is dedicated the improving the lives of African women by providing maternal healthcare and economic opportunities. There are SO many fabulous pieces from the Joe Fresh x lemlem collection for the special women in your family! One of the best days of our trip was when we visited Laniakea Beach (Haleiwa) on Oahu’s North Shore, also known as Turtle Beach. Though the beach itself is quite small and has a rocky edge, but the water was crystal clear and laced with shades of blue and green. The major highlight of this beach is that you WILL be sunbathing and swimming with large green sea turtles! This sea turtle was getting a tan while we stopped by for a visit! 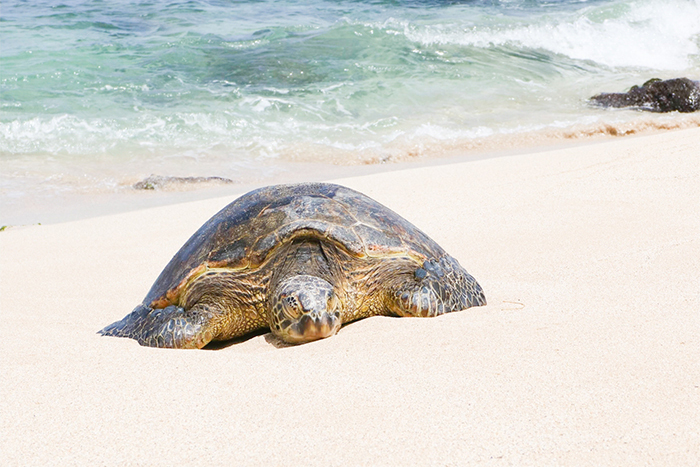 Note, if you plan to visit this beach during your stay in Oahu, be aware that these sea turtles are fully protected under the Endangered Species act and Hawaii state law. They are not to be touched, chased, injured or disturbed in any way. In addition to this guy, we also saw several others poking their heads out the water as they were being washed close to shore from the strong waves. If Laniakea Beach (Haleiwa) is on your list to visit, I recommend (though this is no secret!) visiting earlier in the morning and stopping at the famous Giovanni’s shrimp truck (order the Scampi!) for lunch and quenching your thirst with a refresher at Wow Wow Lemonade. Both are in walking distance of each other and just a short (10-15 minutes) drive from the beach. On our way back to the city, we also stopped by the Dole Plantation to ride the Pineapple Express and a enjoyed a cup of Dole Whip (OMG, so tasty!). I’m working on a Hawaii travel guide and hope to share that with you soon, so be sure to check back!